What was the Roman Empire? While the Romans were based in Rome in Italy, they ruled over land that went far beyond the borders of Rome. This was called the Roman Empire, and it covered large parts of land all around the Mediterranean Sea – even part of Great Britain. The Romans got this land mostly by fighting battles with other groups of people, like the Celts in Britain – when the Romans won, they’d get more territory to add to the Empire. This meant that Roman culture had a huge influence on other cultures, and it’s why finding Roman artefacts (like coins), and ruins of Roman walls and buildings (like Hadrian’s Wall) is so common in the British Isles today. Rome was a republic before it became an empire – it was governed in a different way, and had rulers that were elected through votes. The Roman Empire began in 27 BC, and after that one emperor would rule it until he died. The first emperor was Caesar Augustus. Rome had a mix of very good emperors, like Augustus, and very bad emperors, like Nero. The first 200 years of Roman Empire is called the Pax Romana, which means ‘Roman peace’. It was a time of great prosperity for the Romans. The Romans had already won a lot of land through battles when it was a Republic, some of which led by Julius Caesar. Roman armies were known for being excellent in battle – they used their weapons well, they worked well as a team, and they nearly always defeated their enemies. The Romans invaded Britain and started ruling it in 43 AD. When the Romans were in Britain, they based themselves in London, which they called Londinium. The Romans left Britain in 410 AD because the armies were needed to defend other parts of the Empire. The Anglo-Saxons were the next group to rule England. The Roman Empire lasted for a long time after this. It had already split into two parts in 285 AD, with the Western Empire ending in 476 and the Eastern Empire being overthrown in 1453. Britain was invaded again, and this time the Romans stayed. The first Roman emperor was Caesar Augustus in 27 BC, who was Julius Caesar’s adopted son. That’s why 27 BC marks the start of the Roman Empire. In the Roman Empire, coins were more than just money – they were ways for the emperor to tell about the great things they did (or wanted people to think they did). Coins could be minted that showed pictures of them with their name or other words and symbols on it. The Romans invaded Britain in 43 AD. Julius Caesar had tried to conquer Britain a couple of times before – in 55 and 54 BC – but hadn’t been very successful. The first time he had to leave because his ships were getting ruined in a storm, and the second time he had to turn around and go back to Gaul. The Romans decided they didn’t want to take over land as far north as Scotland, so they built a wall to separate England and Scotland and keep out the Celtic tribes who lived there. This is called Hadrian’s Wall because Hadrian was the Roman emperor at the time. You can still see the wall today. When the Romans got to England, they got to work straight away building roads and forts so they could transport soldiers around the country. They also built things that they would have used if they were still in Italy, like bath houses and villas. Britain was just a very small part of the Roman Empire. The Romans ruled land all around the Mediterranean Sea, including parts of northern Africa and around the Black Sea. 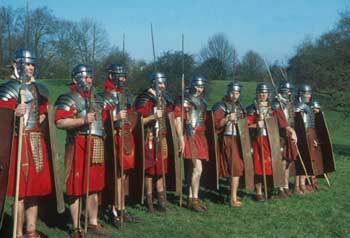 Roman armies were very well trained and organised. They were hard to beat, which helped the Roman Empire expand so quickly and conquer more lands. Roman soldiers had to be at least 20 years old when they joined the army, and they had to stay in the army for 25 years. After that, they were rewarded well with some money or land that they could farm. Can you find the following images in the gallery below? Before it had emperors, Rome was a republic and ruled by the senate along with two consuls leading. Roman emperors ruled for their entire lives, but their succession didn't work like kings in a monarchy – someone in their family wasn’t guaranteed to be the next emperor. The senate was still around even though Rome wasn’t really a republic anymore, and if they or the Roman military didn’t like the next person in line then they’d find someone else to be emperor instead. The people running things in England at that time when the Roman armies invaded in 43 AD were the Iron Age Celts. Some Celtic tribes accepted the fact that the Romans were there to stay, but others still tried to fight to get them to leave. The Romans built towns around England to help them govern it better and keep organised, which the Celts didn’t really have before. The largest one was London, which they called Londinium. Other large towns were Colchester and St. Albans. Roman towns were all laid out in the same way – each had straight streets shaped in a grid pattern, with buildings like a bath house, temple, aqueducts and an amphitheatre. They also had forums, which were big open squares where people could set up stalls to sell things. A lot of these features were in Rome, so having them in these new towns in England helped the Romans feel more at home. The Roman emperors were a mixed group of some good rulers, and some very bad rulers. But whether the emperors were good or bad, things worked out pretty well for the Roman Empire during its first 200 years – this was called the Pax Romana (‘Roman peace’) and was a time of great prosperity. Eventually, the Roman Empire became too big to rule very well. In 285 AD, Emperor Diocletian split the Roman Empire in two halves, East and West. The Western Empire ended in 476, and the Eastern Empire carried on until 1453. Britain was part of the Western Empire, but the Romans left it in 410 AD, well before the end of the Western Empire. This was because the soldiers and leaders who ruled Britain were needed to defend other parts of the Empire. All of the roads, buildings, coins, forts and other things that the Romans had created in Britain were left, which is why we can find so many things from the Roman period around England today. A Roman army consisted of 30 legions, with each legion having between 4,000 and 6,000 legionaries (certain kinds of solders) in it. A legion was commanded by a legate, and had 10 cohorts. A cohort had six troops. A troop had 80 legionaries, also called centuries. Centuries were led by a centurion. Legionaries were paid the most and were the most highly trained. Auxiliaries were soldiers who weren’t Roman citizens; they weren’t paid as much as legionaries and did jobs like guarding forts or being in the front line of battle. Artillery soldiers were in charge of catapults, which could fire things into the air and over onto the enemy’s armies or buildings. The cavalry were soldiers who rode horses when they fought. The infantry were soldiers who marched on foot. Soldiers fought with both their weapons (swords, spears and javelins) and with their shield, which was called a scutum. They’d hold up their scutum to defend themselves in battle, or they’d join with other soldiers to form one big shield if they wanted to advance. Soldiers on the inside of the group held their scutum up over their head, while the soldiers on the outside of the group held their scutum out to form a ring. This formation was called the testudo, which is the Latin word for tortoise. Nothing was going to get past that! Augustus (63 BC-14 AD) – Augustus was the first emperor of Rome. After Julius Caesar died, Augustus formed a new government with Marc Antony and Marcus Lepidus – a triumvirate. It fell apart about 10 years later though, with Augustus the only one left to rule. He worked out new laws that formed the Roman Empire, which was then governed by one person for their lifetime. Claudius (10 BC-54 AD) – Claudius was the fourth Roman emperor. The invasion of Britain happened while he was Emperor, and he was responsible for building new roads and aqueducts across other parts of the Empire. Nero (37-68 AD) – Nero became the Roman emperor after Claudius. He spent a lot of money building theatres and having athletic competitions, and he became pretty unpredictable. If he thought someone was threatening his power, he’d usually have them killed. He was emperor during the Great Fire of Rome, and some people thought he started it himself so he’d have room to build a new palace. Whether or not that’s true, the Roman senate became more and more frustrated with him and told him he was going to be arrested and put to death. Rather than have that happen, Nero killed himself. Hadrian (76-138 AD) – Hadrian was the 14th Roman emperor, and ruled during a very successful time for Roman Britain. He is known for having a wall built along the border of England and Scotland (Hadrian’s Wall) and for rebuilding the Pantheon, a temple to the gods that the Romans believed in. He is also the third in a group of five emperors called ‘the Five Good Emperors’. Marcus Aurelius (121-180 AD) – Marcus Aurelius was the last Roman emperor of the Pax Romana, and also the last of the ‘Five Good Emperors’. The Roman Empire expanded even further during his reign. Constantine (272-337 AD) – Constantine the Great was proclaimed emperor in York. He was the first emperor who was also a Christian, and he tried to unify the Roman Empire again after it had been split into the East and West. He moved the capital from Rome to a new city which he called Byzantium, later called Constantinople after him. Today, it is called Istanbul, which is the largest city in Turkey. Hannibal (247-183 BC) – Hannibal was a military leader from Carthage, who fought against the Romans in the Punic Wars. He is known for bringing an army of soldiers and elephants over the Pyrenees Mountains and the Alps into northern Italy, which at first was successful in fighting against Rome. The Roman military eventually worked out how to beat Hannibal’s army and won, but Hannibal’s tactics are still thought to be pretty impressive today. Take a walk along the defensive wall that the Romans built in London. Walk along part of Hadrian’s Wall, and see a Roman fort. The largest Roman amphitheatre was in Chester. Colchester was one of the largest Roman towns in England.